QUAKERTOWN, PA> If you've been to the Quakertown Farmers Market during Easter this year, you've most certainly met Hampton Impressions owner, Danielle Weiss. Danielle, a professional photographer and graduate of the New York Institute of Photography, was this years photographer for Easter Bunny photos inside the main market building. 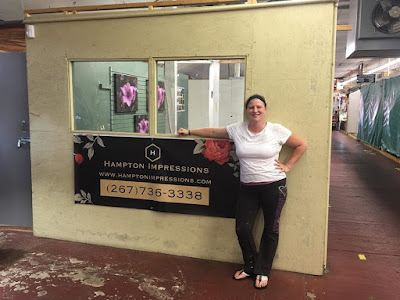 Her shop, Hampton Impressions - Gallery at Barn 2, is located in the Barn 2 Shops (#retail location #14 - behind the main market building) right inside the main entrance, across from Flip City Shakes. This past weekend, Hampton Impressions transitioned into a new, larger area inside the Barn 2 Shops! Hampton Impressions - Gallery at Barn 2's new spot within the market place will now feature in store private and event photography bookings, print purchases, event gatherings, local art expos, photography consultations, artist and author in store appearances and more! Danielle is very excited to open up her new space and feature artists and photographers from the local area! Hampton Impressions also produces The Upper Bucks County Kid Con every year at the Quakertown Farmers Market. In growing her business over the past two years, Danielle's work has been seen from the Lehigh Valley, down to Philadelphia and out to New Jersey. Currently, Hampton Impressions, Gallery at Barn 2 offers a variety of Danielle's printed work for sale and printed on canvas. Danielle continues to grow her portfolio as often as possible! So stay tuned for new updates and prints and be sure to get over to the main market during the Christmas season for your Santa photos! Hampton Impressions full service list can be found online.